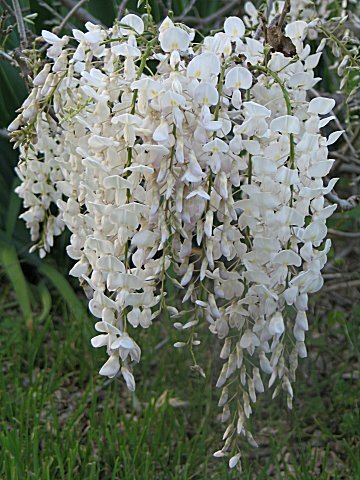 This plant is native to western White Japanese Wisteria is a beautiful and rare wisteria with pure white flowers in racemes up to 10 1/2 inches long. It blooms heavily and frequently, producing a second, smaller display in late summer. These potted plants are cutting-grown from flowering wood to ensure bloom at an early age. All bloom in late spring to early summer. A rapid, vigorous grower to 25 feet, perfect for creating a spectacular show on a pergola or against a wall. These tough, drought-resistant vines require minimal care and don't even need to be fertilized. Plant in a sunny location near a strong support. Prune after flowering and again in late winter if you wish to control its size. Wisteria are easy to train into standard or "tree" form. Just attach the trunk of the plant to a sturdy 5- or 6-foot stake and trim all but the topmost branches. Prune as needed to keep the vine in bounds. The goal is to acheive a bushy top growth that is supported by the vine's trunk. Remove the stake once the standard is established. Zones 4-9. Ships bare root, Sizes vary from 6-18'' at time of shipping. Some of the plant materials in this shipment are DORMANT. Which means that even thought they have no green top growth, they will grow from dormant buds when temperatures are right. For many perennials, This 'rest period' is ESSENTIAL to good flowering performance in the upcoming season.